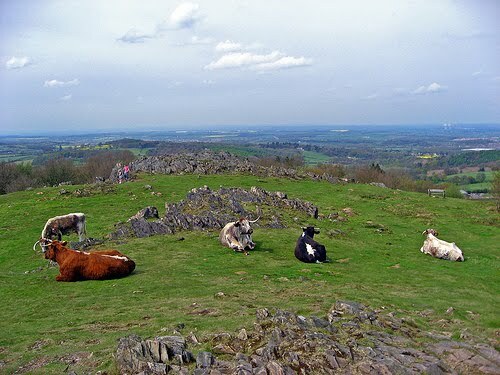 I've lived around Loughborough for close to 10 years now and heard people mention Beacon Hill many times but never given it a second thought. I've always imagined it as a fairly ordinary green hillock. So it was a nice surprise when I finally checked it out. 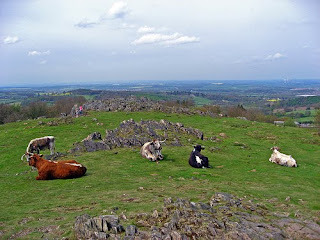 Its actually the 2nd highest point in Leicestershire (perhaps not the hilliest county) and the site of a 3000 year old Bronze Age settlement. We arrived in the car park and climbed the hill to the beacon just as the sun was setting, casting a orangey pink glow over everything. From the top you can look out over Loughborough and try to work out what's what. Loughborough University's Towers Halls stands out as Loughborough's tallest landmark. Following the path round, we came across some black sheep and long horn cattle grazing. And then had a laugh running headlong down the hill, expecting at any moment to fall over but not really caring. Then along the path, past Jubilee Woods and back round to the car park. A short, gentle evening escape which showed me its always worth looking for that little gem of a walk that can be found surprisingly close to home.